Massena (population 355) is located along Highways 92 and 148 in Cass County. The community takes pride in its agricultural heritage, which is still very much a part of the town’s economy. 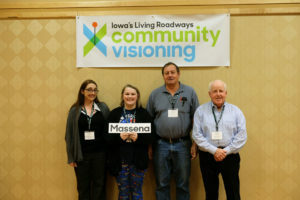 The goals of the Massena visioning committee are focused on Main Street, community parks, trails and signage, and stormwater management. The assessment process revealed that all demographic groups want a safe and accessible walking trail with amenities. 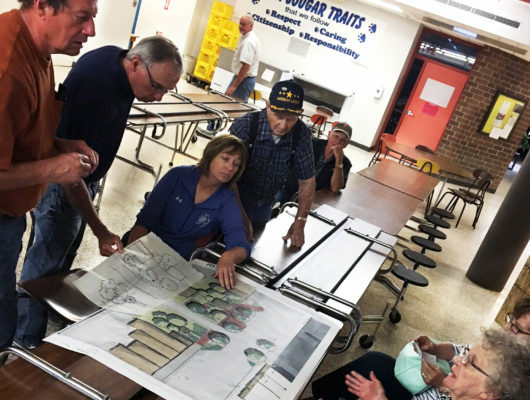 Issues that residents identified in focus-group discussions include flooding in some areas, broken or nonexistent sidewalks, and speeding traffic. Main Street – Install bump-outs at intersections and midblock crossings with plantings and overstory trees; install pedestrian-scale lighting and replace planters, benches, and trash receptacles. Heritage Park – Add interpretive panels, seating, and walkways. City Park – Reconfigure programmed elements and regrade portions of the park to improve accessibility, relocate the basketball courts, and create new green spaces . Trails – Create a dedicated trail that connects important destinations in town. Signage – Create sign panels for existing signage that highlight Massena’s motto, “home of friendly people,” and that can be used for other forms of branding such as banners, websites, and trail signage. Stormwater Management – Implement grass swales, bioswales, and check dams in key locations to slow water and decrease erosion.